Since its reincarnation in last year after a seven year hiatus, Softexpo has once again become the premium event of the country’s software and app makers, stepping out of the shadow of its big brother—Digital World. 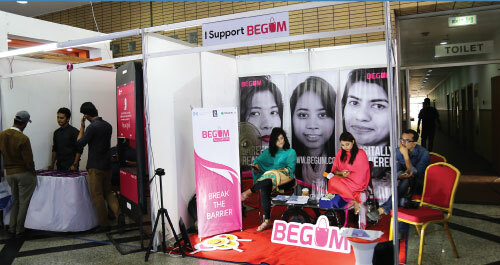 Organized by the Bangladesh Association of Software and Information Services (BASIS), this four day event from February 22-25 held in the Bangabandhu International Conference Center (BICC) this year was no different. An increased footprints and business deals than the last year’s event are the testaments of even better output this year. 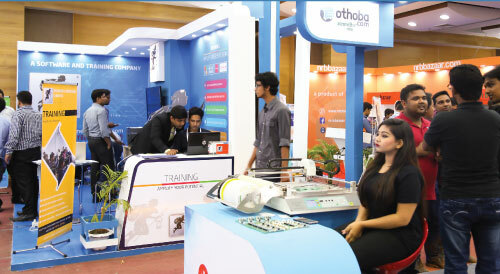 The revival of Softexpo has definitely helped in bagging proper policy support, soft loan at lower interest rates, and the capacity building of skilled manpower—because of which Bangladesh has exported software packages to 70 countries in FY2017-18, fetching in USD 800 million. “We’ve set a target of USD 1 billion by exporting software products and services during FY2018-19,” he also said. “Currently, three to four lakh people are employed in this sector”, he added. About the Softexpo, Kabir said it has been really successful. “A software company, Connect-7, bagged businesses worth Tk. 3 crore during the fair. This company provides Enterprise Resource Planning (ERP) solution to business entities,” said Kabir. 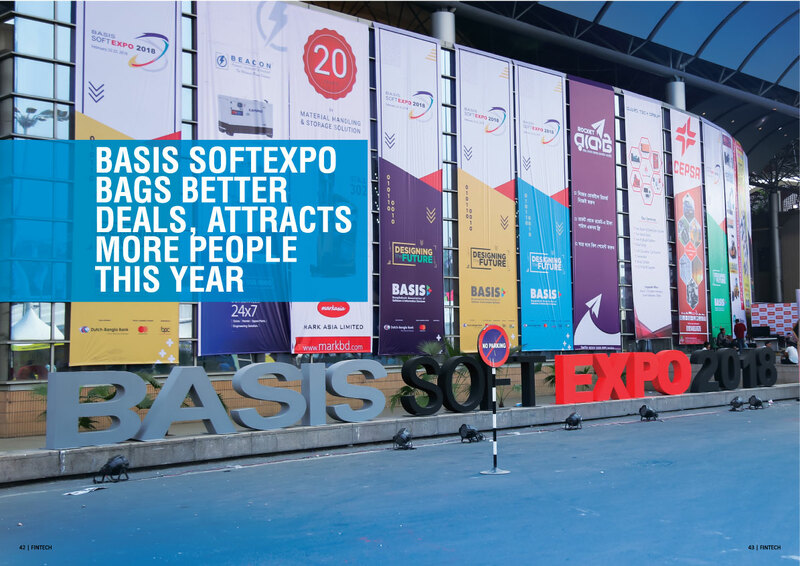 According to BASIS, more than 200 national and international IT companies showcased their products and services in the expo this year. Different ICT companies, key policymakers, industry leaders and other ICT stakeholders took part in the four-day event. BASIS SoftExpo 2018 was divided into four individual zones: software showcasing zone, mobile innovation zone, digital commerce sone, ITES and business process outsourcing (BPO) zone. Also, the B-2-B (business-to-business) matchmaking session was a unique opportunity for Software and ITES companies. In the ‘innovative zone’, students showcased their projects, including the artificially intelligent robot ‘Bangro’, at the expo. Reve Systems Ltd started their operation way back in 2003 and has been dominating the IT market with their exclusive products. 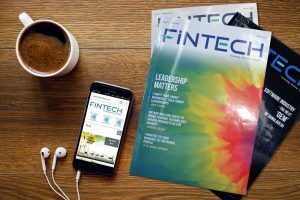 When asked about the ‘Secure Communication App’, Waliur Rashid Tamal, assistant manager (marketing) of Reve Systems, told Fintech that the app is a highly secure, uninterrupted, reliable and customised platform for business enterprises. He said the app helps to ensure real-time business communication and collaboration. It creates a virtual office platform where the members of a team can interact seamlessly from different locations, he added. This app is available in all major platforms such as iOS, Android and Windows. It is even compatible with different web browsers. Its key features are audio and video calling, instant messaging, call conferencing, directory search, location tracking and sharing, message broadcasting and auto message deletion, among others. Tamal said Reve Systems currently exports their products to 78 countries including the US, the UK, Russia, Lebanon and Hong Kong. Explaining the specialty of REVE Antivirus, the firm’s CEO, Sanjit Chatterjee, said that REVE Antivirus is proud of being a Bangladeshi company that has started exporting the product abroad including India and Nepal. “Smart Trolley is a shopping trolley that uses computer and radio Frequency identification (RFID) technology to assist the shopper in various ways. It gives the exact location of items on a pre-entered list, suggests alternative products, gives information about discounted items on nearby shelves, and provides a running total of the prices of the contents,” he said. Automated Rail Gate System aims to provide an automatic railway gate at a level crossing by replacing the gates operated by the gatekeeper. “First, it deals with the reduction of time for which the gate is being kept closed. Second, it helps to provide safety to road users by reducing the accidents,” Shafiqul added. Talking about Intelligent Home and Office System, Shafiqul said the system has four features—security and ease of access, personalised and customised settings for your home appliances, real-time home monitoring, and autonomous environment setup learning. Shafiqul also said DataSoft has developed a local online microfinance management solution for mobile applications to promote the local software. Along with domestic use, this application is also being exported, he added. “Project BangRo” was created by a team of eight students of Dhaka Polytechnic Institute. Farid Hossain, team leader of the project, told Fintech that Bangro is a multilingual informative robot designed by them. BangRo can understand both Bengali and English, respond to instructions, and interact with a person very easily. “It can also take a picture of a person and recognise his or her voice as well,” Farid Hossain added. Explaining the current situation of the software industry, Razib Ahmed, director of the e-Commerce Association of Bangladesh (international affairs), said: “Local software companies are showing their capability to handle medium and large projects within the country. But the Bangladesh software industry does not often get the due credit due to the lack of promotional activities in the international arena. “Bangladesh also needs to perform in IP (Intellectual Property)-related issues. Another big challenge is the paucity of funds. If we want to earn USD 5–10 billion, we need to invest heavily in the entire ecosystem,” he pointed out.